Dr. Elaine Ramey Beck, D.D.S., 76, passed away following a lengthy battle with cancer on Saturday, June 30th, 2018. She was born on September 6, 1941, in Bellflower, California, the daughter of the late Mildred and Wiley Ramey. She was the eldest of 3 children and is survived by her brothers, Wiley P. Ramey, Jr., and James Ramey. Dr. Beck grew up in the San Joaquin Valley on California and graduated from Coalinga High School in Coalinga, California, in 1959. Originally attending Occidental College in Los Angeles, California, she transferred to the University of Georgia in 1960. She married Luther H. Beck, Sr., of Clayton, Georgia, in 1962 and began studying at Emory University Dental School, becoming one of the school’s first female graduates in 1966. Shortly after graduation, Dr. Beck moved with her family to Commerce, Georgia, and practiced dentistry for 52 years, providing dental care to her patients until her last weeks. She was active in many community concerns, including the Downtown Commerce Streetscape program. 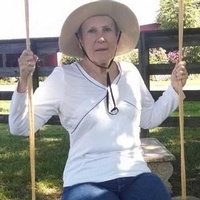 Dr. Beck had a lifelong passion for tennis and she and Luther grew and sold daylilies through Harmony Grove Gardens, as well as serving as judges at daylily conventions around the southeast. Survivors include her husband Luther Beck SR. of Commerce, Ga, her one and only child, Luther H. Beck, Jr. and his family, including wife Rhonda and grandsons Jackson and Jarrod, nieces Murielle (and James) Adair of Portland Oregon , Veronique Hartley and Chelsea (and Patrick) LaBoon and nephews Russell Ramey, Kevin (and Lillian) Ramey and Matthew Ramey and Laura Mullis, all of California. A celebration of Dr. Beck’s life will be held at the Commerce Civic Center on July 11, 2018 at 6:00 p.m.